Traditional advertising way like banners, posters, leaflet, are all weak of attracting attention. Even for traditional LED screen, it can be applied for advertising, but when it is for the glass wall building, it will affect light and vision of the building. However Transparent LED screen is a kind of innovative LED screen which is specially designed for glass wall buildings advertisement. 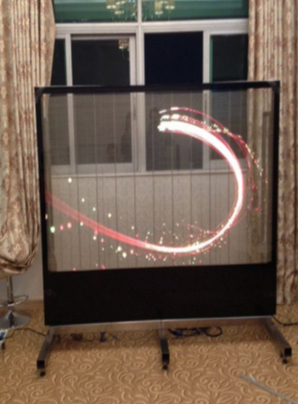 It enables your transparent surfaces come alive with entertainment, visual beauty and communication. It not only covers the function of traditional LED screen, but also shows its unique aesthetics and transparency. You can share any content with viewers 24/7. It can help shop owners to improve brand image and attract many mom customers. It can bring magic effect to your glass surfaces. Wide applications: Expo, fashion show, showroom, transparent lift, glass wall office, Chain stores, shopping malls, brand shops, commercial street, hotels, Auto 4S store, cool club, landmarks etc. In addition, it also can be applied to any transparent place to share information like a work of art. Transparent led screen make full use of glass wall buildings and also increase the building technology, and make the building unique. More and more glass wall building are appeared in the world. which are widely found in the city. And these buildings are a potential market for advertising and media. And the advertising value of this glass wall haven't been exploited by people yet. So there will be a promising market for transparent LED screen. The glass wall building is another new advertising field for people to deal with the situation of advertisement resource exhaustion. And just at the right time, We specifically designed transparent LED screen for glass wall advertisement. This kind of transparent LED screen, on the one hand, can be a tool for advertisement, on the other hand, it can be a decoration or a work of art for these buildings, bringing people a shock impression, and even making the building become a landmark.